The Just Comment Blog is going in a new direction and having something of a rethink. We’re changing the direction of the current page from a random drop-by-and-dump-your-comments-kind-of-place to a new kind of Blog that involves more community interaction and shared learning. There will be two immediate changes. Starting in March we’re going to create a conversational book-club that will for a month at a time engage with a chosen book to see what it can say to our movement. You're invited to read along with us and drop in your comments - reflections on what we're saying or thoughts the book might have stirred in you. A small group might want to consider the conversational book-club as something good to frame and fuel discussion. Throughout the alternative months we will be posting interviews of people involved at the coal-face, stories of people who have committed themselves to the pursuit of social justice. We’re hoping that these new directions will serve you better, prove to be deepening and sustaining and make it possible for even more people to become involved in our conversations. 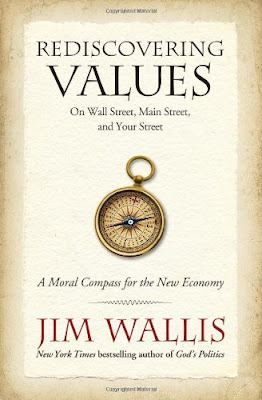 Jim Wallis, 2010, Rediscovering Values – A Moral Compass for the New Economy.